Less than a week ago I returned from a 3 week trip to Thailand. Although we arrived in Bangkok, often referred to as the most polluted city in the world, we headed North and visited Chiang Rai, Chiang Mai, Pai and others. Eventually, however, we flew South and first stayed on the coast in a small city called Kraby, from which we visited some small islands. The highlight for my visit to Thailand came when we took a ferry to the island called Ko Phi Phi (pronounced, ko pee pee). 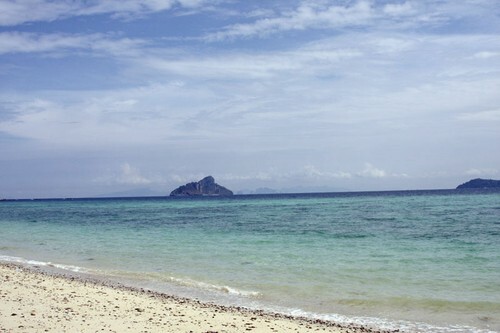 This island was one of the ones devastated by the tsunami of 2004. 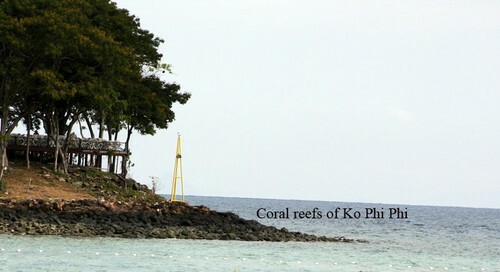 Not surprisingly, I was very interested in how the famous coral reefs in the Andaman Sea fared, at least those I could get a look at from Ko Phi Phi. Unfortunately, I didn’t have an underwater camera, so I’ll have to describe what I saw. Just snorkeling off of the tip (see photo 1) at low tide brought into view some of the most beautiful coral gardens I have ever seen. Most of the growth was relatively new, recovering after the tsunami. The Acroporidae was about 1 foot to 2 feet tall and was growing on top of the Acroporidae rumble left by the 2004 tsunami. There were patches of green and blue/purple colonies of Acropora sp. and fields of Acropora sp that were gray but with beautiful blue growth tips. All in all, in the small area that I covered, I counted at least 20 different Acropora sp. There were also dark blue encrusting Montipora sp., or what liked like Montipora to me. There were Fungia sp. on the bottom. Almost every shape – branching, columnar, scroll, etc. — that hermatypic corals come in I saw. There were quite a few dead table top Acroporidae that I saw which were still standing, but nearby there were many new tabletops growing, some of which were already more than a foot across. And, much to my surprise and delight there were many Tridacna sp. clams: All over, embedded in dead coral there were T. croceas, which were electric blue. There were also T. derasa and squamosa. clams. The amount and beauty of this coral garden’s new growth following the tsunami was surprising to me. On a parting note, in Brooklyn, NY at Pratt institute there will be a major Frag Swap and mini-conference. The date is April 27th. For more information go to ManhattanReefs.com’s forum for a post about the conference.